Cinnamon Roll Snack Bites - Gluten Free, Vegan, Paleo Approved! Disclosure: This post is sponsored by The a2 Milk Company. 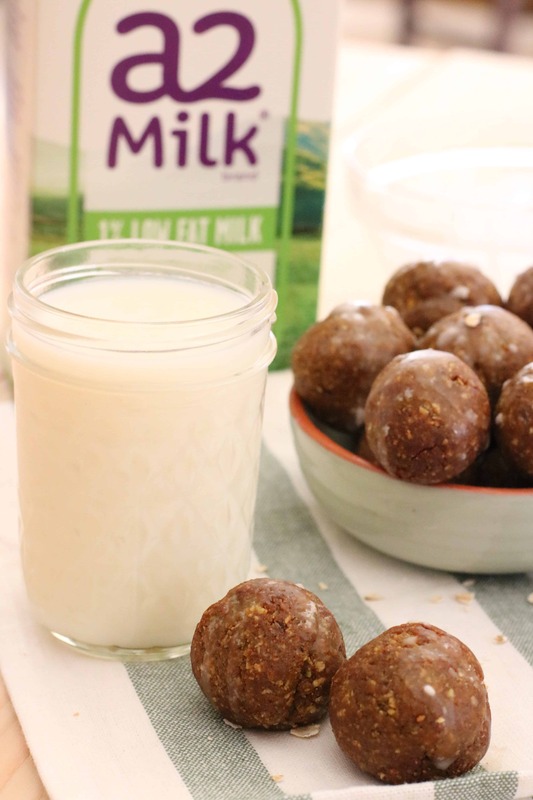 I’m a proud partner with a2 milk and am so excited to share this recipe with you! I must warn you though, proceed with caution, these are addicting. Despite your better judgement, you give in. Suddenly, that 5 minutes turns into 10 and before you know it you run out the door without your breakfast. The office has holiday bagels but you think you’re being “good”, so you skip the nourishment and forge forward into lunch. Lunch comes and goes, and that meeting you got grabbed into was NOT a lunch meeting! Beyond the point of HANGER and just down right ready to eat your arm, right? Promise me, don’t eat your arm. Ok? Settle down, take a deep breath, and make these Cinnamon Roll Snack Bites first. 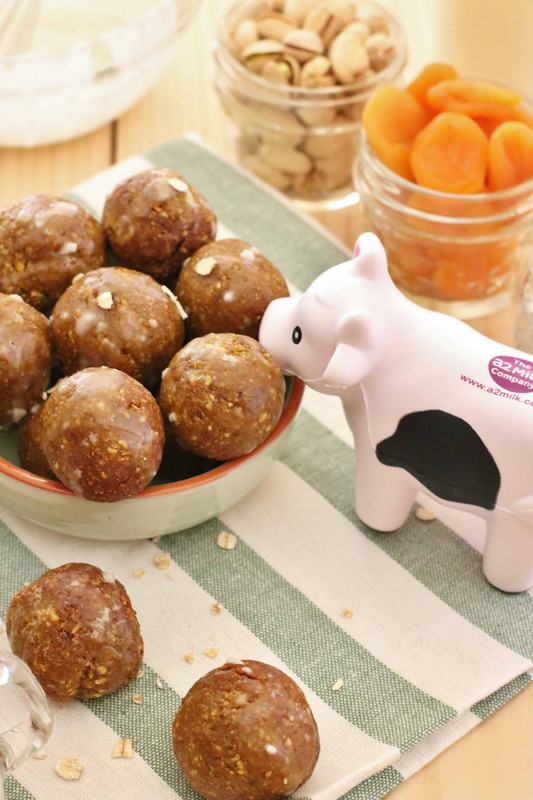 Cinnamon Roll Snack Bites are the best thing to make for an on the go snack! Gluten free and vegan, too! In a food processor fitted with a metal blade, place the apricots. Process for 1 minutes, or until smooth. Add in the pistachios and pulse in 10 seconds intervals until a coarse consistency is achieved, usually within 30 to 40 seconds. Add in the vanilla, cinnamon and salt. Process 15 seconds. 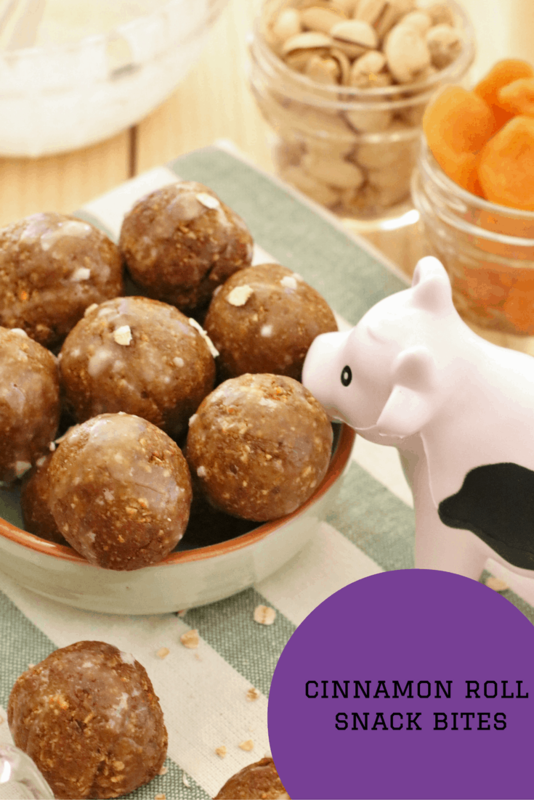 Remove and using a tablespoon form into round bites. Place on a cookie sheet and refrigerate one hour. The key to preventing holiday hanger really comes down to nourishing your body on a regular schedule despite the chaos of parties, meetings and life! I’m here today to show you 3 simple swaps to include a2 milk into your diet so you can ward off that holiday hanger and nourish your body with sound, quality nutrition. Now, as you know from the Chocolate Pudding and S’mores Milkshake posts, a2 milk is a-okay for those individuals who “think they can’t drink milk”. a2 milk still has lactose, but studies show its actually not the lactose that causes people to avoid milk. It’s the a1 protein that causes an inflammatory response in the body and those sensitive to milk are most likely sensitive to the a1 protein. Thus, thanks to the wonderful world of SCIENCE, a2 milk was born! And no, a2 milk is not some artificial product made in a lab. See this little guy here (we’ll call him Bessie); a2 milk comes from Bessie. Bessie has a2 protein only in her body, not a1. We know that because Bessie let us do a DNA test on her and it showed us she was a1 free! Basically, it’s like having brown eyes or blue eyes. It’s not something we change (well, unless you wear colored contacts), it’s genetic. That’s just like a1 versus a2 cows! Okay, I’m losing some of you, let’s move on to those 3 swaps! 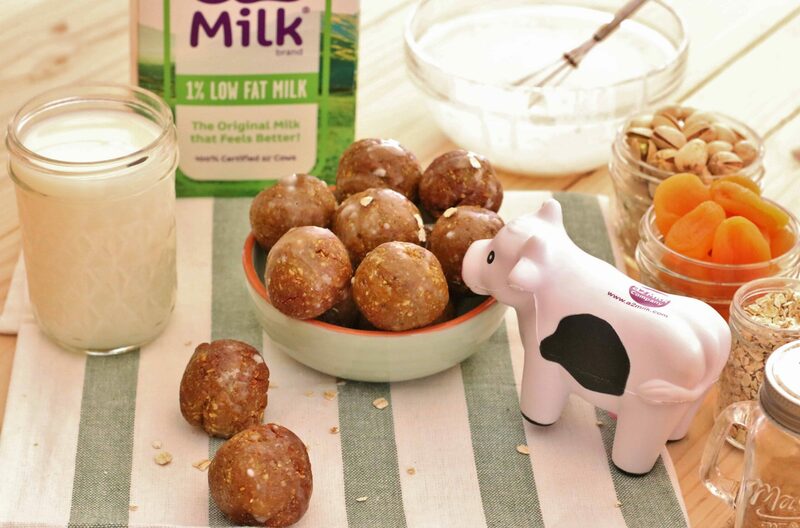 Swap out the water in your oatmeal and make it with delicious a2 milk! Not only will you deliver your body a solid 8+ more grams of protein, but you’ll also get a plethora of nutrients, like potassium, phosphorus, calcium and more! Sayonara almond milk, we’re bringing back a2 milk in our smoothie! Instead of adding a scoop of protein powder (which we know it expensive), blend a2 milk with 1/2 frozen banana and 2 tablespoons of chocolate peanut powder to create a delicious power packed mini meal to pair with your side salad. a2 milk and Cinnamon Roll Snack Bites! Phew, now that we’ve settled that, make these Cinnamon Roll Snack Bites NOW, or, pin for later! Tell me, what’s your favorite way to drink milk?! PS– Here’s a live demo of these bites being made! These look like the perfect way to manage “hanger!” And a great recipe for little hands to help with! Thanks Liz! Those bites look delicious! I always have to have healthy snacks with me this time of year especially when things get crazy busy to avoid the hanger! It’s the perfect away to avoid it! a2 Milk is such a cool product! Love that it is natural! Your cinnamon roll bites look delish too. I’d take these anytime my hanger hits! These sounds soooo good! I cannot wait to munch on them! Maybe not as good as that cinnamon roll bread you posted but ready in a jiff! I love that used apricots in this! It’s a nice change from the popular date that’s often used in snack bites like these. Can’t wait to try! 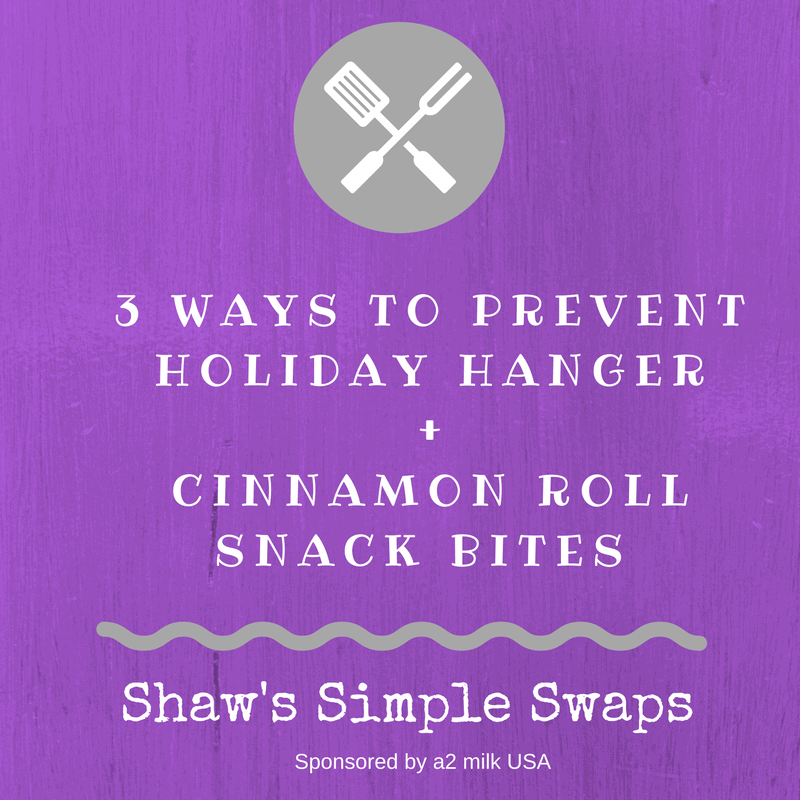 Great swaps to avoid dreaded holiday hanger! Those little bites are perfect for packing just in case! Love everything about these snack bites! So easy to make and keep around for when I need a healthy snack! So excited to hear about a2 milk! I hear you sister – hope this help! Help!!! 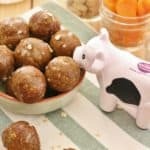 I was so excited to make these and followed the ingredients and instructions to a T. It was a big fail, there was nothing holding the “balls” into a ball. I ended up with just a huge bowl of very expensive pistachio crumbles mixed with a few apricot clumps here and there and no way to roll them up. what can be used as a binding agent? I am so sorry you had trouble with the recipe. I’ve made these time and again and haven’t had this issue, but I think it could be you did not process the apricots long enough to create the jelly to hold the pistachios together. But don’t fear! If this happens you can definitely add a nut butter as a binding agent in at a tablespoon at a time to help bind and oatmeal is always a great addition if you recognize it’s to sticky. Do you remove the pistachio shells before you put them in the blender?